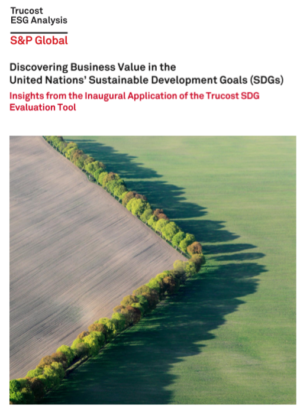 Trucost, part of S&P Global, has announced findings from the inaugural application of its SDG Evaluation Tool. The 13 companies that participated in the inaugural application generated almost $233 billion of SDG-aligned business revenues in 2017; equivalent to 87% of their total revenues. Hey Buddy!, I found this information for you: "Trucost Identifies 3 Billion SDG-Aligned Revenues in Inaugural SDG Evaluation". Here is the website link: https://www.duurzaam-ondernemen.nl/trucost-identifies-233-billion-sdg-aligned-revenues-in-inaugural-sdg-evaluation/. Thank you.